Diana Kennedy is the world’s preeminent authority on authentic Mexican cooking and one of its best-known food writers. Renowned for her uncompromising insistence on using the correct local ingredients and preparation techniques, she has taught generations of cooks how to prepare traditional dishes from the villages of Mexico, and in doing so, has documented and helped preserve the country’s amazingly diverse and rich foodways. Kennedy’s own meals for guests are often Mexican, but she also indulges herself and close friends with the nostalgic foods in Nothing Fancy. This acclaimed cookbook—now expanded with new and revised recipes, additional commentary, photos, and reminiscences—reveals Kennedy’s passion for simpler, soul-satisfying food, from the favorite dishes of her British childhood (including a technique for making clotted cream that actually works) to rare recipes from Ukraine, Norway, France, and other outposts. In her inimitable style, Kennedy discusses her addictions—everything from good butter, cream, and lard to cold-smoked salmon, Seville orange marmalade, black truffle shavings, escamoles (ant eggs), and proper croissants—as well as her bêtes noires—kosher salt, nonfat dairy products, cassia “cinnamon,” botoxed turkeys, and nonstick pans and baking sprays, among them. And look out for the ire she unleashes on “cookbookese,” genetically modified foods, plastic, and unecological kitchen practices! The culminating work of an illustrious career, Nothing Fancy is an irreplaceable opportunity to spend time in the kitchen with Diana Kennedy, listening to the stories she has collected and making the food she has loved over a long lifetime of cooking. Kennedy has written eight classic books on the regional foods of Mexico, including the James Beard Cookbook of the Year Oaxaca al Gusto: An Infinite Gastronomy, The Essential Cuisines of Mexico, The Art of Mexican Cooking, and My Mexico. 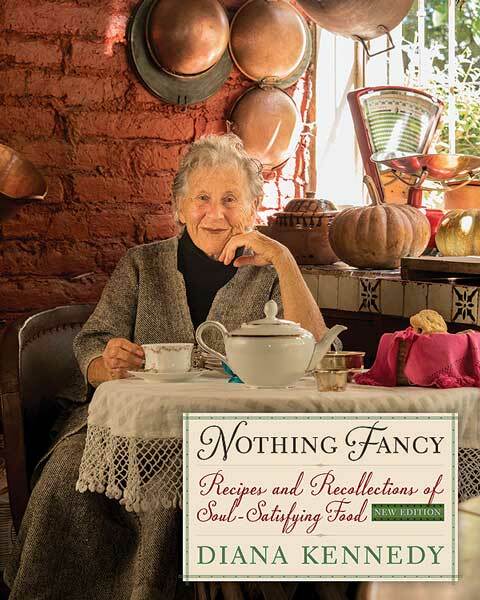 Her many honors include induction into the James Beard Foundation Cookbook Hall of Fame, a Life Achievement Award from the International Association of Cooking Professionals, the Mexican Order of the Aztec Eagle, and the Member of the Order of the British Empire (MBE).